2018 was yet another amazing year for StayLinked, and we are once again very grateful to our amazing partners who continue to make it all happen. "As our business continues to grow we fully realize the importance of the contributions from our partners and are thrilled to recognize their outstanding achievements," said Dan Hogan, President of StayLinked. "Our partners continue to play a vital role in extending the reach of our products to a global market. We congratulate all of our winners on their leadership over the past year, and look forward to our continued mutual success." SmartTE: The Only TE Modernization That Works Out-of-the Box! StayLinked SmartTE with the Smart Keyboard ensures you can apply touchscreen capabilities to your warehouse applications right out of the box. You may have seen some approaches to Terminal Emulation that claim to modernize the backend application on your device with ease. But if you talk to anyone who has actually tried these software approaches, you’ll often hear the same refrain: It doesn’t work. At StayLinked, the folks we’ve talked to who are actively looking for an alternative are amazed at not only how well SmartTE works, but how easy it is to use. And with Smart Keyboard, StayLinked is once again leading the way to true out-of-the-box TE modernization. If you're running Terminal Emulation using one of our competitors' approaches, odds are you're paying for licenses that are not in use. It's that simple. Unfortunately, with device-side licensing, the devices that aren't being used (devices sitting in cradles, devices that aren't working, device in lockers and drawers, and devices that are being repaired) are all unnecessarily using licenses you've paid for. This can be an added and invisible expense that many customers may not be aware of. With StayLinked, license are only required by devices in use. Because of StayLinked's unique centralized architecture, licensing is handled only when devices connect through the central server. This ensures you pay for the licenses you use, and not your entire inventory of mobile devices. And with StayLinked iQ you can manage your permanent and temporary licenses in an easy-to-use interface that gives you visibility into usage patterns, so you can see what's going on. From there, optimization is a snap. Other systems simply can't do that. StayLinked's fully-integrated architecture uses a single server to handle your business processes: TE application clients, session persistence, modernized screen design, fair licensing, and business intelligence. Everything you need for TE in your warehouse can be done with one StayLinked server. That means that installation is easy (less than 10 minutes) and maintenance is minimal. With StayLinked, upkeep is easy and inexpensive, and because it's tightly-integrated, administration is simple. Other approaches, however, require multiple servers to accomplish a lot less than what the StayLinked solution offers. This means more headaches during the installation process and ongoing support for troubleshooting multiple servers that may not even be in the same location. 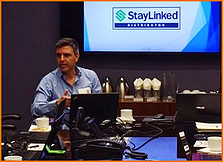 For over 20 years StayLinked has been delivering world-class solutions for mission-critical, host-based systems in the warehousing, manufacturing, transportation, and retail industries. It was our deep understanding of these host-based systems that led our team of technology experts to introduce a new paradigm in terminal emulation and session management for mobile devices.